Tria had initially wanted a deficit set as low as 1.6% next year, hoping to respect European Union demands that Italy progressively cut the fiscal gap to rein in its high debt. The coalition government of the 5-Star Movement and the League, which took power in June, had been pushing for a deficit around 2.4% of GDP to fund costly policy pledges, while Tria had been slowly shifting his position but trying to hold out for something below 2.0%. “There is an accord within the whole government for 2.4%, we are satisfied, this is a budget for change,” 5-Star leader Luigi Di Maio and League chief Matteo Salvini said in a joint statement after meetings with Tria. The statement appeared to refer only to the 2019 deficit target, but government officials and Justice Minister Alfonso Bonafede later said the same deficit level would be maintained for three straight years to 2021. The policy marks a striking shift from the previous centre-left administration, which had targeted a deficit of 0.8% of GDP in 2019 and a balanced budget in 2020. Italian asset prices may come under pressure on Friday, as financial markets had expected Tria to resist the spending push from Salvini and Di Maio, who are both deputy prime ministers. “Until today markets had been betting on Tria’s capacity to rein in political forces. That assumption is now crumbling,” said Francesco Galietti, head of Rome-based political risk consultancy Policy Sonar. Tria did not immediately comment, but Di Maio and other government officials said he had no intention of resigning. 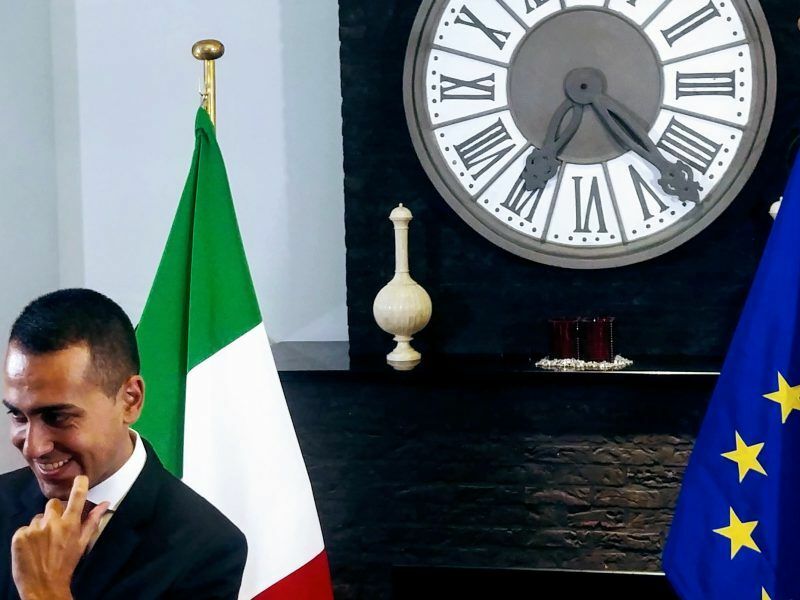 Italian vice prime minister Luigi Di Maio abruptly cancelled participation in the Competitiveness EU Council in Brussels on Thursday (27 September) and flew back to Rome to smooth tensions with Economy Minister Giovanni Tria on Italy’s draft budget, which seeks to increase spending. A meeting of the full cabinet to sign off on the government’s economic and financial targets for the next three years ended at around 11 p.m. with no news on targets for economic growth or the public debt. The ruling coalition had been pushing Tria, an academic not affiliated to either party, to ramp up the fiscal deficit to finance their promises of tax cuts and higher welfare spending. Some coalition voices had publicly told the minister he should quit if he could not back their spending plans. The coalition parties say the priority must be financing policies including a basic income for the poor and a reduction in the minimum retirement age, rather than meeting deficit goals previously agreed with Brussels. A 2.4% deficit target remains inside the 3.0% ceiling prescribed by EU rules, but Italy had promised Brussels it would cut the deficit decisively to curb its mammoth debt. “Today is a historic day, today Italy has changed,” Di Maio posted on Facebook after the deficit goals were announced, as 5-Star lawmakers and supporters gathered outside parliament waving the movement’s flags. Di Maio said the 2019 budget, which must be presented by 20 October, will set aside €10 billion for 5-Star’s flagship policy of a “citizens’ income” of up to €780 per month for 6.5 million poor Italians. Salvini said the budget would also allow people to retire earlier, freeing up about 400,000 jobs for the young, and cut tax rates for a million self-employed workers. 5-Star, which has been overtaken by the League in opinion polls, was particularly keen to present the budget as a political victory. 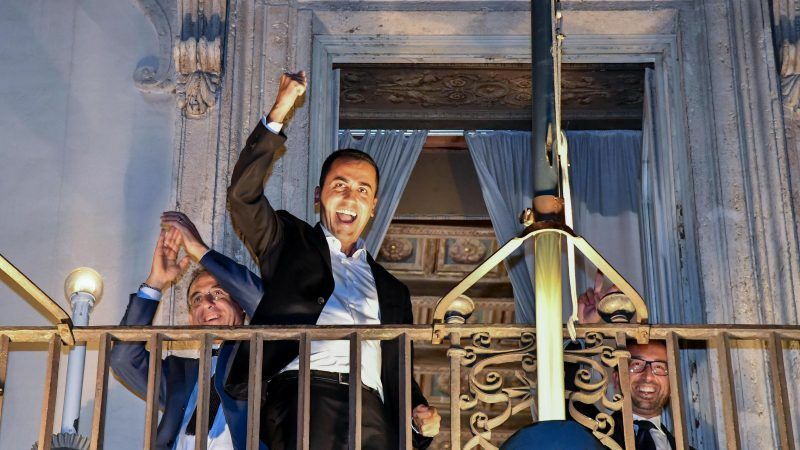 Its ministers gathered on the balcony of the prime minister’s residence in central Rome, waving to party supporters in the square below. Financial markets have been nervous since the government took office due to fears its spending plans will boost Italy’s debt, which is already the highest in the euro zone after Greece’s as a proportion of GDP, at around 131%. The League and 5-Star, rivals ahead of an inconclusive election in March, say they will govern together for a full five-year term and phase in most of their policies gradually.